Today, the First Flight Commemorative Half Dollar Coin remembers the first successful air trip across the African continent, which landed on March 20, 1920. The first aviators to cross the African continent from north to south were Col. van Ryneveld and Maj. Brand, but in making the long fight they had to use three machines, two being disabled on the way. The first was a Vickers-Vimy airplane, which was named Silver Queen I. In this they flew from Brooklands, England, to Cairo, Egypt, crossing the Mediterranean in a severe storm. On the southward journey from Cairo to Cape Town the machine crashed near Wady Halfa, and was so badly damaged that the aviators had to return to Cairo, secure a new Vickers-Vimy plane and start the journey over again. This time they got as far as a point near Bulawayo when their machine, which they had named Silver Queen II, was wrecked in making a forced landing. The pilots, having covered 3,880 miles of the trip, were determined to complete it, and they were assisted by the Union of South Africa government, which sent them a new machine called the Voortrekker (Pioneer). In this they finally reached Cape Town, where they were welcomed by large crowds and entertained by Lord Buxton, governor-general of the Union, and Gen. Smuts. Col. van Ryneveld and Capt. Brand are both South African Dutchmen who made fine records in the great war. Their whole trip was an adventurous one and they had several narrow escapes from disaster. Leaking water jackets, together with the heat and high altitudes, caused most of the trouble. Feb. 4.—Silver Queen I flies from Brooklands to Turin. Feb. 8–Sollum (Western Egypt) reached after crossing the Mediterranean in a storm, the journey from Taranto taking 14 hours. Feb. 10–Cairo left at 11.36 p. m. on a nonstop flight to Khartum. Feb. 11—Silver Queen I crashes at Wady Halfa. Machine wrecked but engines salved undamaged. Feb. 16—Col. van Ryneveld and Capt. Brand return to Cairo. Feb. 22—New start from Cairo on Silver Queen II, fitted, with engines of Silver Queen I. Descent at Wady Halfa owing to head wind. Feb. 23–Khartum reached. Machine detained by engine trouble. Feb. 25—Flight from Khartum to Mongalla. Feb. 26–Silver Queen II reaches Kisumu (Victoria. Nyanza). Feb. 27—Flight from Kisumu to Shirati (89 miles only ). Feb. 28–Nonstop flight from Shirati to Abercorn, Northern Rhodesia. Feb. 29–From Abercorn to N’Dola. March 2–Livingstone (just above the Victoria Falls) reached. Machine detained by heavy rain. March 5–Flight from Livingstone Bulawayo. March 6–Silver Queen II crashes a mile from Bulawayo when starting for Pretoria. Col. van Ryneveld and Capt. Brand remain at Bulawayo pending arrival of a new machine sent from the Cape. March 17–Col. van Ryneveld and Capt. Brand leave Bulawayo on the Voortrekker (the machine which replaced Silver Queen II) and fly to Pretoria. March 18-20–Flight continued from Pretoria to Cape Town by way of Bloemfontein: arrival at Cape Town 4 p. m., March 20. The total distance traveled from London to Cape Town was about 7,500 miles by the route followed. From Cairo, to Cape Town the distance covered was 5,206 miles. The total actual flying time from Brooklands to Cape Town was only 4 days 13 hours and 30 minutes, but the journey as shown by the diary took about seven weeks. Under the auspices of the London Times an attempt was made to make an airplane flight from Cairo, Egypt, to Cape Town, South Africa, a distance of 3,220 miles in the spring of 1920. The machine uses was a Vickers-Vimy-Rolls commercial, having a speed of from 99 to 115 miles an hour and a nonstop flight capacity of 1,000 miles. The pilots were Capt. S. Cockerell and Capt. F. C Broome, Sergt.-Maj. J. Wyatt was the mechanic and Claude Corby the rigger. Prof. P. Chalmers Mitchell, D. Sc., LL. D., F. R. S. was the scientist and correspondent of the expedition, after the start from Cairo, to which place he went by the ordinary means of travel. The machine with the others left Brooklands, England, Jan. 24, and flying by way of Lyons, Marseilles, Rome, Malta, Tripoli and Benghazi arrived at the aerodrome near Cairo, Egypt, Feb. 3. Leaving Cairo on Feb. 6 the party arrived at Assuan, 425 miles distant, the same day after a forced descent at Luxor for repairs. The 7th was spent at Assuan in repairing a leaking water jacket. On the following day Khartum, 1,044 miles from Cairo, was reached, after two forced descents on account of faulty engine. On this flight an interesting discovery of a volcanic field between Old Meroc and Berber was made. Feb. 9 was devoted to further repairs and the next day’s flight brought the machine to a point northeast of Renk, where the craft landed in a dry swamp. Here the aviators had to sleep in the open. The next day they returned to Jebelein, 1,252 miles from Cairo, for repairs. Two days later (Feb. 14) another start was made and some progress was made in spite of leaky engines, terrific heat, and forced landings in rough clearings in the jungle. The night was again spent in the open. Mongalla, 1,730 miles from Cairo, was reached on the afternoon of Feb. 15. Considerable time was lost here in tinkering with the leaky engines and the flight was not resumed until the 20th, when a point near Nimule was reached. In sleeping around a camp fire that night the aviators were much disturbed by lions. The next day the machine could not rise and another night had to be spent in the jungle. On Feb. 22, the party had better luck. The machine worked well for a time, taking the aviators across the Nile at Murchison falls and thence to Jinja. Here another day was lost, but on the 24th Kisumu, 2,246 miles from Cairo, was reached. On the 25th the machinery was overhauled once more and on the 26th Tabora, 2,678 miles from Cairo, was reached. At this point in Tanganyika territory, which was wrested from the Germans in the war, the flyers thought their troubles were nearly over, as what was looked upon as the worst part of the route had been traversed, but on the next day, just after making a second attempt to leave the ground, the machine crashed on some ant hills and was so badly, damaged that all thought of resuming the flight was abandoned. Two of the crew were slightly injured. But for the defective engines, the fight would probably have been completed without great difficulty. 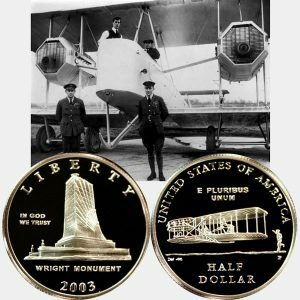 The First Flight Commemorative Half Dollar Coin shows with an image, circa 1920, of the successful crew in front of their first airplane, the Silver Queen I.